Mrs. Shirley Frances Johnson Trotter passed away Thursday, January 17, 2019 after a sudden illness. Born on September 17th 1936 in the New Holland community of Aiken county to the late Kohan Leroy and Effie Mae Waters Johnson. Surviving are her husband of 63 years, John E. Trotter of Lexington; daughter, Sherry Ann Trotter Waters of Aiken; three sons, Richard A. Trotter, Ronald D (Joyce) Trotter, and David L. (Emily) Trotter all of Lexington; brother, Jasper Eugene (Daisy) Johnson of Aiken; sister-in-law, Blanche Johnson of Warrenville; and daughter-in-law, Judy E. Johnson of Columbia, SC. She was predeceased by oldest son, John E. Trotter, Jr; sister, Annie Lacola Johnson Keisler; and a brother, Kohan L. Johnson, Jr. Survivors also include grandchildren, Bryan Trotter, Kyle Trotter, Kayla (Cody) Arave, Chet (Cassie) Trotter, Elizabeth Trotter and Jessika Johnson; and great grandchildren, Mia Trotter, Liam Arave, Walter Trotter and Lilly Mae Trotter. Her first love was taking care of her family. After marrying the love of her life, John, she immediately became a military wife spending over twenty years traveling around the world with him raising their five children. Her other interests included gardening and genealogy. 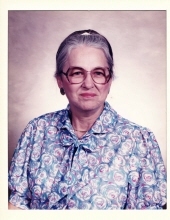 She was a charter member of the Dutch Fork Genalogical Society holding the position of newspaper editor for over twenty years. Also holding chapter secretary, cemetery committee and chapter representative to the SCGS positions. Funeral services will be held at 2:00 P.M. Sunday, January 20, at Milton Shealy Funeral Home Chapel with interment in the New Holland Cemetery with Rev. Jerry Smith officiating. Visitation will be held from 12:30 – 2:00 P.M. before the service at the funeral home. Active pallbearers will be her sons, Richard, Ronald and David Trotter and grandsons, Bryan, Kyle and Chet Trotter. In lieu of flowers, memorials may be made to the American Cancer Society or charity of one’s Choice. To send flowers or a remembrance gift to the family of Shirley Frances Johnson Trotter, please visit our Tribute Store. "Email Address" would like to share the life celebration of Shirley Frances Johnson Trotter. Click on the "link" to go to share a favorite memory or leave a condolence message for the family.